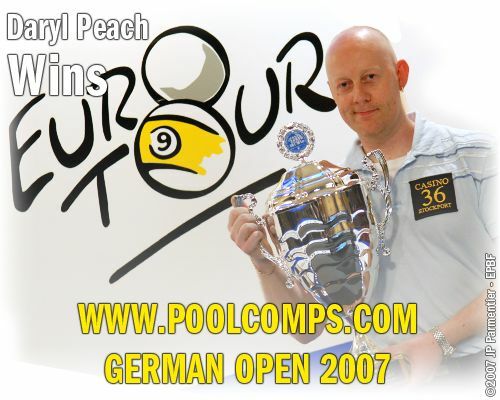 England's Daryl Peach won the PoolComps.com German Open. In the final he defeated Dimitri Jungo (Switzerland) 10-3 to win €5000. Jungo took home €3300 for the runner-up position. In the semi-finals Peach beat Spain's David Alcaide and Jungo defeated Ralf Souquet from Germany. This was Peach's first win on the Euro Tour. He has previously finished runner-up once and third twice. Defending champion Harald Stolka (Germany) ended up in 33rd position. With this victory Peach jumps from 15th to fourth in the Euro Tour Ranking. Losing finalist Jungo moves from 202nd to 97th. Niels Feijen (Netherlands) moves up one spot to the top of the rankings. Fabio Petroni (Italy) improves from third to second and Oliver Ortmann (Germany) drops from first to third. The tournament was played 2-5 May at "Die Drei", Sindelfingen, Germany. It was the third Euro Tour event of the season. Next stop is the Austria Open (June 13-17).